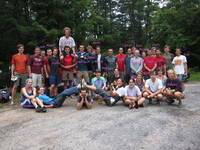 30+ person rock staff trip to the Gunks! Friday night we had pizza and smores at Josh's house. Woke before 5am to drive to the Gunks on Saturday. I climbed with Chris and Adam. We went to the Nears and climbed Birdland, Yellow Ridge and Layback. Then went to meet everyone at the Uberfall and climbed Rhododendron. The entire group spent the night in the Vernooy Kill State Forest off Lundy Road. I had a great swim, though I was sweating again by the time I walked back to my tent. Sunday I climbed with Ariel and Dan. We had a great time on Three Pines, then went to the Uberfall to meet the other groups. We set two ropes on the Gerdie Block. I got to climb Dogs in Heat (aka Nurdie Gerdie). For all the times I put a rope on the Gerdie block, I've never done this climb. The two hard moves took me a couple of tries, but I got the climb fairly quickly. Also ran up Dirty Gerdie later in the day to take down anchors. We had planed to stay and climb Monday, but the forecast convinced us to head home Sunday night.